Our very own, Amara Tsampas, has become a KMS California educator! We’re so proud of her and excited for the benefits that come with having such a skilled KMS expert in our salon. Amara joined Hairmates in 2004 while in cosmetology school to get a head start on her career and further her training and education. She graduated in 2007 and has been continuing education ever since. She’s completed various courses through Goldwell, KMS, Wella, Simply Smooth, Deva, Vidal Sassoon and others. Amara is always up for anything! 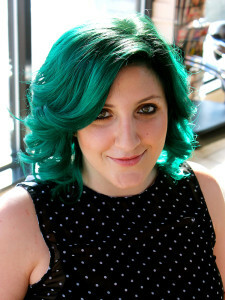 This easy going stylist enjoys funky color, glamorous cuts, personalized styling, and everything in between. Amara is an extreme animal lover. She loves the outdoors and anything involving nature. Every day Amara wakes up with one mission: to make people smile and feel good about themselves. You are sure to laugh around this spunky lady!